Not many applications I work on these days are solely using the traditional server-side rendering model. Neither do they employ 100% client-side rendering and templating. Usually it’s a mix in which the ‘old’ world meets the new world, giving rise to some interesting design decisions. In this article I want to explore a solution that combines both worlds while minimizing the duplication of rendering logic by embedding JSON in the view. After the initial request to the server, the first page of products is shown. Once the page is shown, we want the paging links to be AJAX-enabled: no full page reloads. 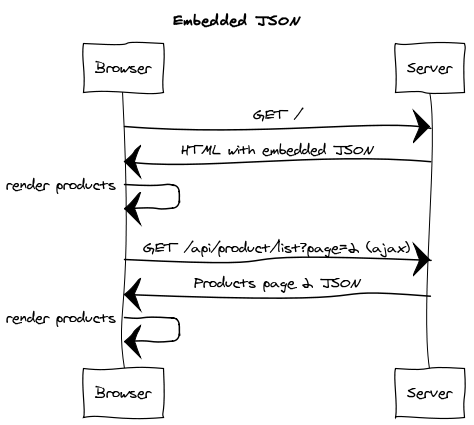 The server just returns JSON representing the products and the client renders them in a table. Depending on the network latency the effects range from nearly unnoticeable to very annoying. In my example I added a 400ms delay to illustrate the effect of the additional roundtrip. Deferring the rendering of the complete page until the Ajax call completes is even worse. And think of how this would scale with many components on the page using this approach (hint: there is a limit to the amount of concurrent connections browsers make). Another option is to not pass JSON to the client, but return server-side rendered (partial) HTML for just this component. The trick is then to modularize your server-side code so that you can have a single template for both the initial request and subsequent AJAX calls. Component-based frameworks like JSF favor this approach. However, the consensus seems to moving towards consuming JSON on the client, giving the added benefit of a real API rather than a specific rendering band-aid. // Fetch products using Ajax call and update html. // On document.ready, render first products. With this trick it’s possible to blend server and client-side rendering where appropriate, without any duplication. In the complete example you will see that the pagination links are actually still rendered with a server-side forEach loop. As an added bonus, it is trivial to revert to the initial state of the page without a roundtrip to the server (the embedded JSON never changes). Since that’s not always appropriate I didn’t implement it in this sample app. Of course after I ‘discovered’ this trick it turned out I wasn’t the first. There are some drawbacks you should keep in mind. The biggest disadvantage is that whenever your JSON contains the string ‘</script>’, this trick breaks. The browser closes the script block the moment it encounters this tag, whether it’s a part of a JS string or object literal, regardless of context. Escaping on the server is in order, since cross-site scripting is otherwise possible. Because most webframeworks either render JSON or HTML as response, not a combination, you may have to look around for a solution. In my example I use the Jackson ObjectMapper directly from the controller, with some small trickery to force the result into a string. Other frameworks and languages provide similar capabilities, for example simplejson.dumps in Python. One of the attractive properties of the client-side only approach is that you can do away with server-side rendered templates completely. Instead, HTML can be served from an edge node in a CDN for example. 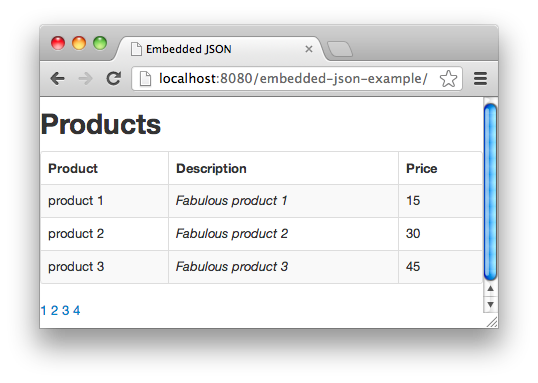 Obviously, when you want to embed dynamic JSON this won’t fly. May be Edge Side Includes can help, but it was never accepted by the W3C. Lastly, when you’re trying to unify client and server-side rendering for accessibility issues (i.e. the site must work without JS enabled), this is not the trick for you. Even though all information is provided in a single request, you still need JS to do the rendering. It’s not progressive enhancement by any definition. 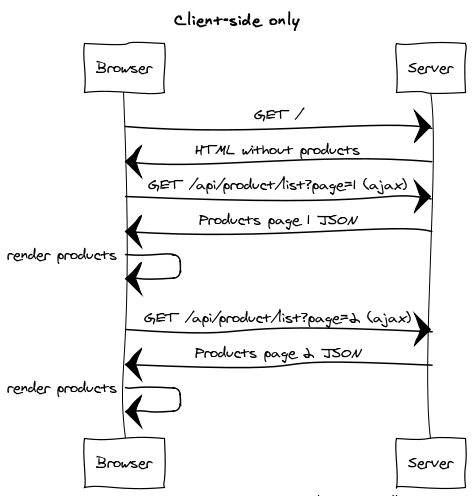 If that’s you want, you might enjoy LinkedIn engineering’s blog post on how they went the other way around: falling back to ‘client-side’ templates on the server in these cases. Like with any technique you’ll have to weigh the pros and cons for each application. In my opinion, avoiding the ubiquitous first AJAX callback while still maintaining only a single template is worth a lot.